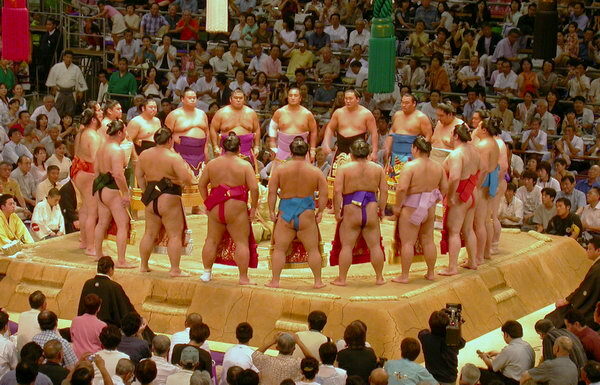 Just got back from a long, long day in Nagoya at the sumo tournament. It was a wonderful experience, but the long drive home through stop-and-go traffic and a lightning storm has left me exhausted. I will post more pics as I get around to editing them (got the backlog from last weekend, too). But for now… Time to sleeeeep. That was an awesome trip, even though me and Matt got on the bus at 8pm on friday, got off on 7am on saturday, and had to get back on at 8pm that night, returning at 7:15am this morning. It was worth it, but I have heard (and expect to continue hearing) “why the hell did you do that” many, many times. Trips like these make me feel really Japanese. But who’s that kneeling in the middle! ?